I’m now three weeks into my recovery from back surgery, and more appreciative than ever, of what God is doing in my life! Because of the many prayers, great care, support and encouragement I’ve received; I’m healing really well for someone who went home from the hospital after a lumbar fusion just three weeks ago. Does love heal? You bet it does! Love was in the delicious foods brought to my front door, over the last two weeks! With cheerful smiles, my sweet friends greeted me, afraid to hug me; because they didn’t want to hurt my back. But I grabbed them into a bear hug and said, “Yes! Hug me! Your hugs are my favorite part!” And we laughed like children, as I told them the hugs have been helping me to heal! 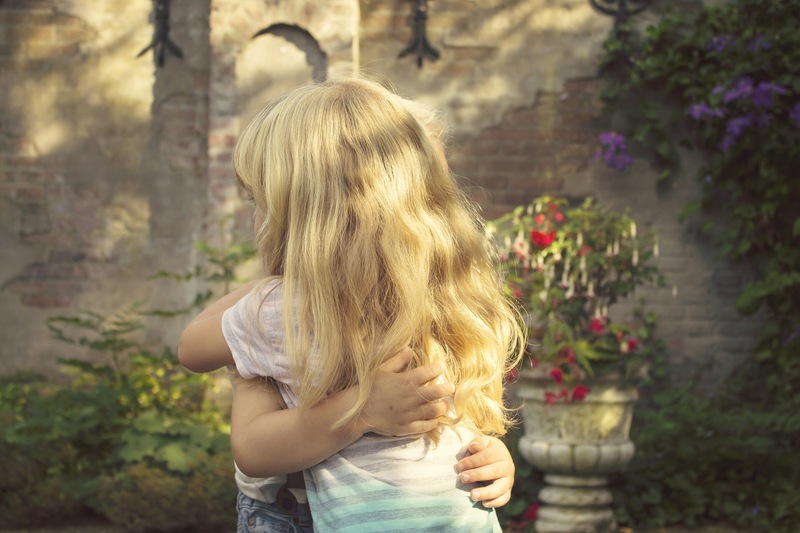 When you’re healing, every little thing seems like a big thing: every hug warms you deeper inside, every tasty morsel tastes extra delicious, and every visit makes you appreciate the fact that your friends have chosen to give you some precious moments of their time. The travel was for you, the meal was cooked and baked in love for you, and the laughter and kind concern was for you! When you’re healing, it’s a struggle when you can’t get in the car and drive yourself to your appointment and grab some groceries on the way home, and sneak in a quick stop at your favorite thrift store, Hope’s Treasures. But wait! God has already planned out everything, and His plan is even better! One of my teenagers volunteered to drive me to my appointment. We enjoyed lunch nearby, at TooSso a kitchen-style restaurant, which quickly serves up delicious Pakistani favorites. TooSso means “stuff yourself!” I asked for its meaning the first time I visited. 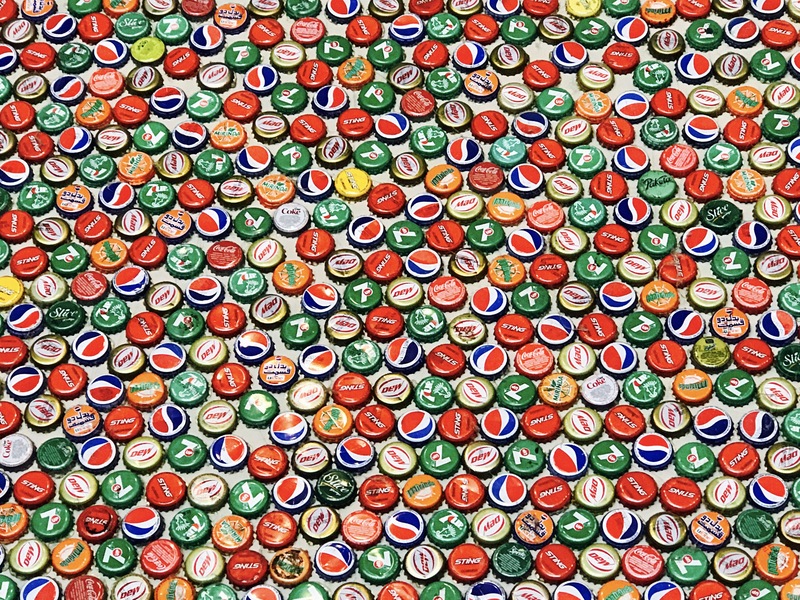 There is an entire cool wall covered in bottle caps… I love interesting, artsy things! Then leaning on my cane, for my daily walk, we went into… YES! Hope’s Treasures! There were records and books which kept him interested, even though he’s always patient with me, so I can look around! The money spent there goes to help the homeless community of Loudoun. I like the spirit of compassion at the center of this place. 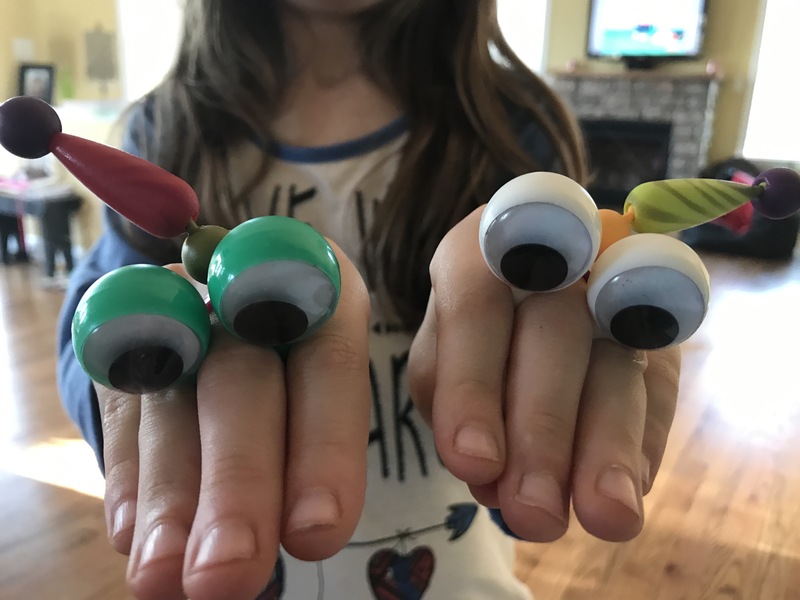 There’s always something fun and inexpensive to take back home, like this funky collection of beads, which my daughter used to create into party hats for her Oobies! Meanwhile, my other son, was at home, caring for my daughter. She is very social and constantly needs to be learning and engaged. She’s like a beautiful flower that needs to be sung to, along with being watered and set in sunlight. 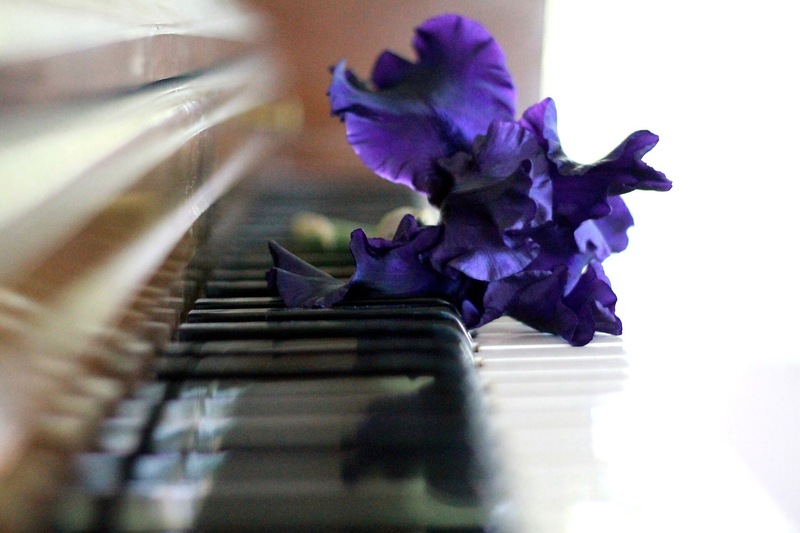 If you didn’t sing to her, she’d still be beautiful, but it’s always a shame to miss out on the extra blooming of beautiful flowers, just because you didn’t stop and take the time to give them that little something extra that they need. My son did that for my daughter. They did one of her favorite things; which was to create a movie together using her stuffed animals, their voices, and his editing software on his computer. It was my favorite movie yet! Our family came home at different intervals, to a delicious home-cooked meal, made by my precious friend, Sharon, who attends our church, and is famous for her delicious pies! We enjoyed slow-baked chicken, mashed potatoes, asparagus, fresh salad, and oh; my husband’s favorite and mine… a real old-fashioned strawberry rhubarb pie! 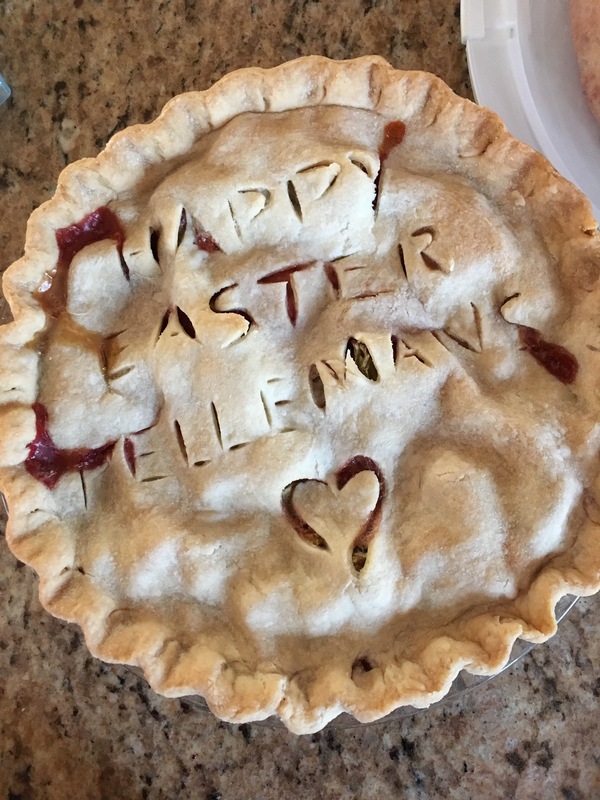 The message was lovingly carved into the crust, “Happy Easter, Pellemans,” with a little heart as the finishing touch! I could have cried when I took my first sweet and sour bite! But Instead of tears, I was laughing at the movie my kids had cleverly created while the rest of us were out. I took it all in… the joy of it! I knew it was part of the gift of the healing God has been bestowing upon me. After the last scheduled meal, all of which had been perfectly planned to assist during my most difficult time; my husband made a stop at Costco to get us set up for the coming week. He does this all the time, but this time it was so much sweeter. It’s like God has been showing me everything through a finer lens of appreciation. For this is something I absolutely cannot do at this time. He got all our favorites: ice cream, mango salsa, Asian salad, filet mignon, salmon, strawberries, sweet n salty popcorn and more! He topped it off by bringing us hotdogs, which we enjoyed outside that evening, picnic-style. Picnics are my favorite. They contain all things beautiful: family and friends, food, fun, and the freedom and beauty of enjoying all of it outdoors! Yes, healing is tough. But the silver lining is that there’s joy along the journey if we remember to praise God and thank Him for all the good things we have in our lives. I may not even have had the chance to enjoy a strawberry rhubarb pie for Easter, if I had not gone through a surgery! These sweet touches make it all worth it! “Be thankful in all circumstances, for this is God’s will for you who belong to Christ Jesus” (1 Thes. 5:18). Thanking God for the sweet things in life, is kind of like biting into a homemade strawberry rhubarb pie… perfectly delightful! Wonderful post! Heart-warming! (that WAS the idea, right!). A good lesson in thanksgiving and encouragement! Blessings as you continue to heal, dear sister. What a wonderful article! I nearly didn’t read it because I thought, well, we don’t have that stuff where I stay. It is so warmly and graphically written it got me looking around to thank God for things I’d perhaps ignored. Thank you so much for sharing. Beautifully written and I love the way you brought out the joy..so enriching! What a lovely positive post, it sounds like you have got some great friends. I am truly blessed! God has filled a void in my life, by filling it abundantly! I never expected to receive so much love, support, and encouragement at a time it would be so greatly neeeded! God really does meet our needs above and beyond, when we depend solely on Him!